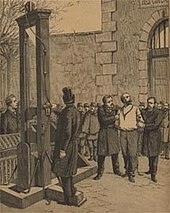 ↑ "Readings - History Of The Death Penalty | The Execution | FRONTLINE". PBS. สืบค้นเมื่อ 2014-02-11. 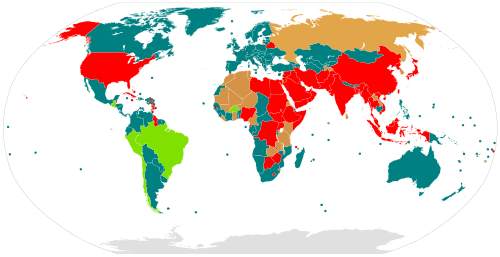 ↑ 3.0 3.1 "Abolitionist and retentionist countries". Amnesty International. สืบค้นเมื่อ 2010-08-23. ↑ "University of Oslo Calls World Universities against Death Penalty - The Nordic Page - Panorama". Tnp.no. 2011-12-05. สืบค้นเมื่อ 2014-02-11. ↑ "Iran, Saudi Arabia, Sudan: End Juvenile Death Penalty | Human Rights Watch". Hrw.org. 2010-10-09. สืบค้นเมื่อ 2014-02-11. ↑ "moratorium on the death penalty". United Nations. 15 November 2007. สืบค้นเมื่อ 23 August 2010. ↑ "Shot at Dawn, campaign for pardons for British and Commonwealth soldiers executed in World War I". Shot at Dawn Pardons Campaign. สืบค้นเมื่อ 2006-07-20. ↑ James Pitkin. ""Killing Time" | January 23rd, 2008". Wweek.com. สืบค้นเมื่อ 23 August 2010. 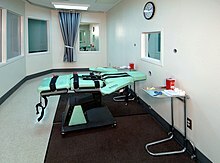 ↑ "The High Cost of the Death Penalty". Death Penalty Focus. สืบค้นเมื่อ 27 June 2008. ↑ "Innocence and the Death Penalty". Deathpenaltyinfo.org. สืบค้นเมื่อ 23 August 2010. ↑ Capital Defense Weekly[ลิงก์เสีย] Archived สิงหาคม 4, 2007 ที่ เวย์แบ็กแมชชีน. ↑ "Executed Innocents". Justicedenied.org. สืบค้นเมื่อ 23 August 2010. ↑ "Wrongful executions". Mitglied.lycos.de. สืบค้นเมื่อ 23 August 2010. ↑ "Ethics - Capital punishment: Arguments against capital punishment". BBC. 1 January 1970. สืบค้นเมื่อ 11 February 2014. ↑ "A history of capital punishment in NZ". TVNZ. 17 December 2008. สืบค้นเมื่อ 10 February 2013. หน้านี้แก้ไขล่าสุดเมื่อวันที่ 21 กุมภาพันธ์ 2562 เวลา 13:57 น.